Read here about an abstract concept that relates to tensegrity research. Yin Yang is a concept that originated in the East of the coexistence of polar, opposite forces. This article discusses how tensegrity informs our conception of opposition, hence it relates to the ancient idea of yin yang, and vice a versa, yin yang can inform our research into tensegrity. . In Chinese philosophy, the concept of yin yang sometimes referred to in the west as yin //and// yang) is used to describe how polar or seemingly contrary forces are interconnected and interdependent in the natural world, and how they give rise to each other in turn. Many natural dualities — e.g. dark and light, female and male, low and high, cold and hot — are thought of as manifestations of yin and yang (respectively). Yin yang are complementary opposites within a greater whole. Everything has both yin and yang aspects, although yin or yang elements may manifest more strongly in different objects or at different times. Yin yang constantly interacts, never existing in absolute stasis. The concept of yin and yang is often symbolized by various forms of the Taijitu symbol, for which it is probably best known in western cultures. There is a perception (especially in the West) that yin and yang correspond to good and evil. However, Taoist philosophy generally discounts good/bad distinctions as superficial labels, preferring to focus on the idea of balance. 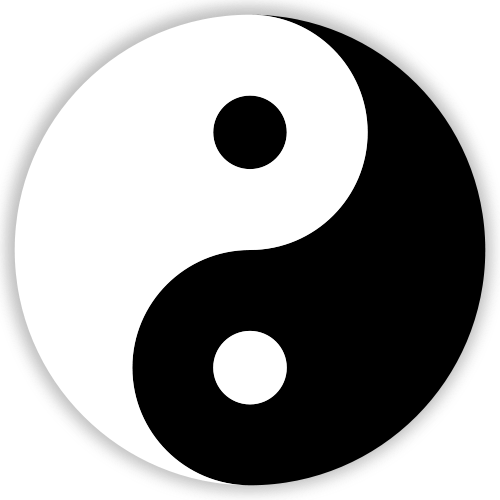 Classic taoist Taijitu symbol expressing the interaction of Yin and Yang. It is impossible to talk about yin or yang without some reference to the opposite, since yin–yang are bound together as parts of a mutual whole (i.e. you cannot have the back of a hand without the front). A race with only men or only women would disappear in a single generation; but men and women together create new generations that allow the race they mutually create (and mutually come from) to survive. The interaction of the two gives birth to things. Yin and yang transform each other: like an undertow in the ocean, every advance is complemented by a retreat, and every rise transforms into a fall. Thus, a seed will sprout from the earth and grow upwards towards the sky – an intrinsically yang movement. Then when it reaches its full potential height it will fall. First and foremost, a tensegrity structure models opposite and equal qualities of tension and compression, while the opposites are completely and qualitatively different. In tensegrity structures, the opposition arises together and it is structure, rather than quiescence, that is achieved. Structure is the ongoing inter-stabilization of the opposite forces in such a time frame as to be perceptible by people. In this section are a few samples of how tensegrity is discussed with yin yang. On 01 December 2014 Ulrica Norberg posted a course notice that discussed yin yang and tensegrity. Our world’s biggest problem is not poverty, drugs, fear of war, or hunger. It is tension. All kinds of tension lead to all kinds of imbalances and insecurities. If one knows how to free oneself from tension, one has the solution to one’s problems in life. If you are able to balance your tensions, you then automatically learn how to balance your emotions, anger, and passions. Yogic philosophy as well as modern psychology sum up three basic types of tension that are responsible for all the agonies in modern life. These are Muscular tension, Emotional tension, and Mental tension. Through the art and practice of YinYoga, these tensions can be progressively reduced. YinYoga focuses on the fascia, the type of tissue that keeps us together. Fascia is the soft tissue component of the connective tissue that provides support and protection for most structures within the human body, including muscle. Fascia is what gives us our form and what makes it possible for us to work our amazing bodies in the ways we do. The fascia is interlinked with our nervous system and our brain through what’s called Tensegrity, or “The Architecture of life.” Tensegrity indicates that the integrity of a structure—in this case the human body and mind—derives from how all parts are wired together, not how they are stacked. We have fascia everywhere, and our nervous system is enclosed in fascial membranes and continues as nerve sheaths to every corner of the body. Thus different types of strain or tension affect the structure in different ways. From a yogic perspective you could say that we are wired together by spirit, and if spirit is limited in its expresssion, the prana, or life force, will be disrupted, and there will be less freedom for energy to move. Yogis would say that less Shakti equals less flow in life. Better flow of Shakti equals better flow in life. Our yoga practice should be a blend of yang/out/action/contraction and yin/in/observation/extension to make the whole balanced and to affect our entire health to move towards homeostatis (the maintenance of equilibrium). Yang yoga is a more vigorous yoga practice that targets the muscular tissue and through movement create heat. Examples of yang based yoga is Ashtanga Vinyasa, Poweryoga and Anusara yoga. Through the practice of Yinyoga, one targets the fascia/connective tissue in the body, which makes it a marvellously therapeutic tool for healing bodily, mental, and emotional imbalances. When you participate in a Yinyoga class, you will experience mostly seated, supine, or prone poses, and you will stay in the poses, not moving, with your muscles relaxed for long periods of time—up to five minutes, sometimes longer. Staying muscularly passive for long periods of time gently stress the connective tissue (which gets stiff and immobile with age and through too much or too little use). Yinyoga poses focus mainly on the lower parts of the body because the abundance of dense connective tissue around the joints in this areas requires extra care and attention. Yinyoga introduces us to the natural edges of our beings in a graceful way. If we push our edges or lead a life that is contantly yang; we move into too much yang, burning energy rather than conserving. On the other hand, if we draw inward too much or lead a too passive lifestyle, we start moving away from life and being present, into the past, sliding backward. Too much yin or too much yang creates imbalances. They need to co-exist side by side in order for us to live our lives in harmony and balance. Yin and yang can be described as two variables; they are either on the opposite ends of a cycle, like the seasons of the year, or opposites on a continuum of energy or matter. The opposition is relative and can only be understood through relationships between the two. For example: Water is yin relative to steam but yang relative to ice. Nothing is totally yin or yang. Just as a state of total yin is reached, yang starts to grow. This is evident in the Yinyoga practice, since after you have gotten deep into relaxation and mental stillness in a Yinyoga pose, the blood circulation increases and you can start to feel heat inside. They constantly transform into each other, just as there can be no energy without matter and no day without light. Yinyoga – the practice of letting go, release tension and move into meditation If you are accustomed to sweating your way into cool poses, Yinyoga may at first glance seem too simple, slow, and boring to some. But this practice of long, passively held floor poses is deeply nourishing and has a myriad of benefits for any yoga practitioner. In yinyoga you move inside with the mentality as the observer, not the as the force of action where you want to change and go to the outer edge. If one does yinyoga and aim to push and move away from discomfort, one experiences no effect rather than more frustration and tension and less circulation. With the attitude of the observer, the opposite happens. So when one practices yinyoga, I find it valuable to have some techniques like breath and visualization in order to calm the restless and aggressive mind down. When you come into a position, move slowly and gently into it. Don’t try to follow a picture or an idea of how far you should go in the exercise. In yoga there are no aesthetic ideals and no end result to strive for. Pause frequently and listen to your body. Wait for the body and mind to respond before going deeper into the position. Finding your limit doesn’t always need to mean pushing yourself. Many yoga practitioners loose their sensitivity to the body’s signals as they go through the motions of a yoga practice day after day, perhaps focusing too much on achieving a physical goal, such as a sculpted body or mastering a new pose. Look instead for just the right amount of intensity in each exercise. Aim for a sensation that you, through the breath, can just be with during each moment of breathing, not having to do or fix anything. Among the terms for “twoness” are duality, binary, twin, pair, couple, double, yin-yang... These words refer to ideas and beliefs in art, literature, religion, science and philosophy in cultures everywhere. Twoness words are associated with good-evil, male-female, north-south, past-future, day-night, up-down, push and pull, life and death... Structures of many kinds provide evidence of a binary phenomenon rooted in the nature of things, with examples in the clockwise-counterclockwise rotation of cog-gears, of compression versus tension in tensegrity structures, in the right and left hand helices of fabric weaving or simply in the reversing of colored squares of a chess board. See links in the body of the page, above.